Introduction: Hearing loss in the elderly is regarded as a public health concern due to its high prevalence and the difficulties it fosters, which affect the elderly's appropriate social life. Objective: To verify the existence of a relationship among hearing loss, age, gender and quality of life of elders who live in a neighborhood in Canoas, RS. Methodology: Visits were carried out to the houses in a neighborhood in Canoas,RS, to check whether there were elders living there.Out of the 72 identified subjects, 51 took part in this study. Audiometric thresholds for pure sound were investigated, and a life quality assessment was also conducted, through a tool from the World Health Organization,the World Health Organization Quality of Life, the abridged version. Results: Most of the elderly (64.7%) showed hearing loss, mainly a slight impairment (29.4%) or a moderate impairment (19.6%). The quality of life was considered regular, with the lowest scores seen in the psychological domain (58.33), and the highest scores in social relationships (75.00). Age influence was acknowledged in the presence of hearing loss, and in the social and physical domains of quality of life. There was no correlation between gender and the other assessed variables. Conclusion: It was not acknowledged a relationship between the presence and degree of the hearing loss and the quality of life. The aging process was determinant to increase the number of elderly with hearing loss and the lower scores in the physical and social domains of quality of life.Gender did not affect the investigated variables. During the last years, the Brazilian population has rapidly suffered deep transformation due to the raise in life expectancy and to drop in birth rates, which has cause the increase in the number of the elderly (1,2). If there was populational stability until the 1960's, some changes have occurred since then. Surveys show that 650 thousand people get in the elderly age every year, which represents an increase of 600% in such population segment in less than 50 years(3). Such increase will make Brazil occupy in 2025 the sixth position among countries with the highest number of elderly people, overcoming 30 million individuals (1). Such increase will reflect on higher demand on public health policies, specially in relation to diagnosis and treatment, a situation which becomes stronger due to the fact that many people have never had access to prevention programs and suffer from the consequences of aggressions to health. The presbyacusis, which is the auditory loss due to aging, is among the alterations which affect most of the elderly Studies prove that auditory deficiency starts in the early thirties, and progressively increases as years go by. Although there is similarity in the audiometric configuration (neurossensorial, bilateral, symmetric hearing loss with descendant curves, in most of cases), men are more precociously and intensively affected than women (4,5,6). Together with the auditory deficiency there are speech signal distortion, tinnitus and dizziness (6). Considered a public health problem, due to its high incidence, presbyacusis is the third most common affection in elderly individuals (7,8). Studies refer that 25% up to 83% of the elderly people are affected (8,9,10). The Brazilian surveys point out prevalences of 63% (11), 81.2% (12) and 89.23% (13). The age increase determines the raise in the number of affected people (10,14). In terms of the degree of auditory loss, elderly people may present mild to deep affection, with high worsening in high frequencies. The deficiencies of mild (11,12); mild to moderate (13) or moderate (15,16) degrees are more common. The deterioration of the auditory system generates deficit of speech recognition (17) , causing several social problems, such as: distance to family and social activities; low self-esteem; isolation; loneliness; depression; irritation (8,14). All these problems definitely affect the individual's life quality (7,18), once it cover his/her socialization and his/her participation in the group in which he/she participates. In order to have an effective integration, a proper communication ability is necessary (19). However, the auditory deficiency has its effects underestimated many times(20), , specially by professionals who are not related to the audiologic area. Consequently, evaluation care are not done and the elderly, who frequently do not accept the problem or consider the auditory deficiency something inherent to aging, do not have access to rehabilitation, which affects even more their life quality(19). The expression quality of life involves several meanings, of cultural, social economical and historical origin(21). In this article, the WHO (World Health Organization) definition is considered, that is, "individual's perceptions in the context of their culture and value systems, and their personal goals, standards and concerns"(22). Due to the variety of views, concepts and definitions, the quality of life assessment is something extremely complex. Among the several instruments developed for such kind of assessment, one which is pointed out is the World Health Organization Quality of Life (WHOQOL), which has been created based on the quality of life definition by WHO, under a cross-cultural approach (23). There are several versions versions of such instrument, many of which have already been translated and validated to Portuguese. Among several versions, we can find WHOQOL-bref, a shorter version of the original instrument, made of 26 questions, two of which are general and 24 related to rages which evaluate 4 domains: physical health, psychological health, social relationships, and environment (22). Due to its dependability, reliability extension and application practicality (self-applicable instrument), it is one of the most used generic scales of quality of life assessment. Although there are highlights over the influence of the auditory deficiency in the quality of life and some studies about the importance of auditory rehabilitation for quality of life improvement (15,19,24), studies of populational basis which referred such topics have not been obtained, mainly in the Brazilian Literature. Taking into account the impact of auditory deficiency on the life of affected individuals and the increase in the number of elderly in the Brazilian population, this study has been chosen to be done, which aimed at verifying the existence of relation between auditory deficiency and quality of life of the elderly who live in a neighborhood of Canoas, RS. This study also aimed at verifying the influence of age and gender variables in the aspects studied. This study has been developed in São Luis Village, Canoas, RS. The choice has been done according to convenience, due to its closeness to the university which would enable elderly people to go to it, in case they were handled to other assessments. This is an inter-disciplinary cross-sectional study which involved professionals and students of degrees of Speech Therapy, Physical Education and Nursing. The group has been formed according to the common interest on gerontology. Meetings have been done to develop the research project, which aimed at identifying the demographic characteristics of the elderly living in the neighborhood and gathering data on audition, quality of life, sleep, pain, power and balance. This project has been approved in the Ethics committee on research of the university (protocol 2006 035H). São Luís, with around 4500 inhabitants, is located at BR 116 freeway, in Canoas, RS. In the beginning of the study, the geographic borders and the number of streets have been identified in the area. After that, domicile visits have been done, aiming at detecting which homes had elderly people, in order to invite them voluntarily participate on the study. Those who accepted signed the Free and Clear Consent Term and were submitted to assessments. The individuals who were 60 years old were more were considered elderly (25). Due to the number of evaluations to be performed, in many cases the second visit to homes has become necessary in order to finish the protocol applications. Initially, the sample was made of 72 individuals. Out of the initial sample, 21 individuals were excluded because they did not agree of doing the procedure or because they were not home in the moment when the auditory evaluation would be done, even after scheduling it by phone. The small number of elderly found in the neighborhood may be explained due to its closeness to the university, which makes most of residences occupied by young people. For data analysis, only the results of the better ear have been considered (26). The quality of life assessment has been done, using the standard by the World Health Organization, the WHOQOL-bref. The shorter version has been chosen, due to its practicality and dependability, once the elderly would have to answer several other questionnaires (demographic, sleep, pain) and the complete version, in that case, would be extremely long (100 items). The WHOQOL-bref application has been has been done according to translators' instructions, that is, the individual was required to think about their life during the last two weeks and to check the column which contained the most adequate answer to their case. The instrument is self-applicable, that is, the individual reads the question and signs the answer. In case they do not understand the question, have reading difficulties or illiteracy, the examiner reads the question like it is written, trying not to explain it in order to not influence the answer. In addition to this, it should be answered at once (22). An expanded version of the instrument has been used, once the normal size of the letter (font 12) would bring reading difficulties due to the age of the assessed individuals (27). After reading one of the 26 questions, the individual had to check the number whose answer were the most adequate one to their situation (1 to 5). The highest number did not always mean the best quality of life. For example, in the question "How often do you have negative feelings such as blue mood, despair, anxiety, depression? ", if the individual checked number one, they would mean they never had such feelings. On the contrary, number 5 indicated that they always have such feelings. On the question "How well are you able to concentrate? ", when the individuals checked number 5, they declare they can extremely concentrate, what does not occur if they checked number 1 (extreme concentration difficulty). The questionnaire has been created with four kinds of answer: intensity, ability, assessment and frequency, each of which had two key words and three intermediate words for answer. For example, in the frequency evaluation ("how often do you. "), the key words are always and never. The intermediate words are seldom, quite often and very often (27). After the questionnaire is filled out, the general and domain amounts must be calculated (physical, psychological, environment and social relations), enabling the individual's quality of life assessment. Such analysis must be done according to the syntax described by translators with the help of the software Statistical Package for Social Science (SPSS) 10.0 for Windows, and the manual accountability and analysis is not recommended due to its high probability of errors (27). For the result analysis, the comparison among groups has been done through Mann-Whitney test (quantitative variables without normal distribution), exact Fisher test (qualitative variables) and Kruskal-Wallis test. In order to verify the co-relation existence, the Spearman coefficients have been used. 1) Mann-Whitney test: has been used to test the homogeneity of age and WHOQOL-bref variables - in the physical, psychological, social and environment aspects - between genders. 2) Fisher Exact Test: has been used to test the relation between genders and normal or altered auditory thresholds. 3) Kruskal-Wallis test: has been used to test the homogeneity of auditory threshold in terms of score of WHOQOL-bref in the physical, psychological, social and environmental aspects, as well as in terms of age. 4) Spearman co-relation coefficient: has been used to study the co-relations between two continuous variables, when they, or one of them, do not represent normal distribution. It has been used to verify the existence of co-relation between the WHOQOL-bref score - in the physical, psychological, social and environmental aspects - with age and auditory thresholds. The age descriptive analysis has been done through the observation of thecalculation of average and standard deviation. For the WHOQOL-bref score, a median with interquantile interval has been used. The absolute frequency has been calculated for the other qualitative variables. The statistical analysis has been done in the SPSS 10.0 for Windows. All tests have been performed in the bi-caudal form, and the p amounts lower than 0.05 have been considered statistically significant. 51 subjects of both genders living in a neighborhood of Canoas city, RS, have been evaluated. The average age was 69.73 ± 7,00 years. Out of the 51 elderly patients, 36 (70.6%) were women and 15 (29.4%) were men. Data related to audition are on Table 1. It has been verified that 64.3% of the assessed patients presented auditory deficiency, from mild to deep degree. Most presented auditory loss of mild degree (29.4%) and moderate (19.6%). On the Table 3, the data stratified by gender are presented, and the age, auditory deficiency degree and (WHOQOL-bref) score are compared in the physical, psychological, social and environmental aspects. No variable analysed presented statistical significant difference. No statistically significant difference was found (p=0.527) when the audiometric alterations (with or without alterations) have been compared between genders through the Fischer exact test. The sample has also been stratified in terms of audiometric alterations (with or without alterations), and the variables have been compared to age and WHOQOL score in the physical, psychological, social and environmental aspects (Table 4). Although the life quality is lower in individuals with auditory alterations, the differences obtained have not been statistically significant with exception of physical domain. The only significant difference has been found in the age variable with or without auditory alteration. The sample has also been compared according to the presence and degree of auditory deficiency (normal auditory thresholds, mild, moderate, severe and deep auditory deficiencies). Only the age (p=0.007) and WHOQOL-bref score, in the physical aspect (p=0.029) variables presented statistically significant differences. The other variables did not present statistically significant differences: psychological domain (p=0.103), social relation domain (p=0.090) and environmental domain (p=0.065). The co-relation between the WHOQOL-bref scores - in the physical, psychological, social relations and environmental domains - and the age and audiometry results have been tested. Moderate and inverse co-relation has been found between age and WHOQOL-bref in the social aspect. The other variable did not present co-relation (Table 5). Data related to the general characterization of the sample prove that there was prevalence of female elderly patients. That may be explained the aging feminization phenomenon, once women present higher life expectation and are more longevous than men (28). In terms of auditory deficiency, the prevalence obtained (64.7%) was lower than the one described in most of the studies referred to in the Brazilian and international literature (8,9,10,12,13) and similar to one Brazilian study (11). It is known that the prevalence studies are very influenced by the selection of the subjects who make the simple. The variability presented by several studies may be explained by the characteristics of the elderly evaluated in each one of them. The exposure to different risk factors for auditory deficiency (medication, noise exposure, ontological infections, diseases), for example, may determine higher or lower prevalence of infected individuals. In addition to this, 70% and 80% values are found in individuals aging more than 70 years old (8) and the simple average age was 69.73 years old. However, a higher agreement with the data obtained in a populational base study done in the same city as this investigation was performed was expected (12), which has not been verified. This may be explained by the fact that in the aforementioned study the audiometric thresholds of elderly patients living in several areas of the city have been observed, and the average of auditory deficiency prevalence has been pointed out. The lack of 21 patients is also pointed out, who were not located to undergo the examination or did not want to do so. The literature proves that several individuals refuse to accept such problem, even when their friends and relatives notice it. That happens because they fear dependency or because they believe the auditory deficiency is a natural consequence of aging. For some individuals, accepting that they have such problem may make them realize they are elderly, a fact which is not always well-accepted, due to negative features related to such age. For such reasons, many refuse undergoing the necessary assessments and prefer living with all difficulties that auditory deficiency cause (19). In terms of degree, most of the patients presented mild or moderate auditory deficiency, which agrees with the Brazilian studies performed (11,12,13). Still related to the general evaluation of the sample, the WHOQOL-bref evidenced similar scores in the domains evaluated, and the best scores were in the social relation domain. Such datum surprised the investigators, once aging is a phase with distance to social life (29) and that most of the patients presented auditory deficiency. The lowest scores have been obtained in the physical domain. Questions were related to sleep, pain, daily activities, dependence on medication and/or treatment and labor capacity (22) and the numbers were already expexted to be low, once the elderly usually have affected health, which causes negative self-evaluation. When the data are considered by gender, it has been verified that there was not statistically significant difference between genders in any of the items evaluated (age, degree of auditory deficiency and WHOQOL-bref results). In spite of the similarity in the average age, it was believed that the audiometric results would be lower in men, mainly due to the results described in the specialized literature, whose authors reveal that auditory deficiency occur earlier and twice more in male individuals (4,5,6). In terms of life quality and gender, the scores obtained in the four domains of the WHOQOL-bref test were also similar differing from what has been reported in other studies (28,30). The investigations on gender and quality of life are controversial, due to the reduced comparative literature concerning the topic and the instruments used for such evaluation. However, what is observed in some cases is that most of women have worse quality of life, mainly concerning health and social life, due to the high index of morbidity and loneliness, maybe because they live longer (30). Considering age, WHOQOL-bref scores and normal or altered audiometry results, there was no statistically significant difference in terms of quality of life, which contradicts what has been described in specialized literature (7,8,14,18,19). However, a significant difference has been verified between the average age of individuals with normal audition and with alteration in the audiometry. The worsening of audiometric thresholds with aging has already been described by other authors(11,12), which corroborates for the findings of this investigation. When the WHOQOL-bref scores are compared in each domain and with the presence of the auditory deficiency degree, statistically significant differences have not been found, what contradicts what has been expected by the investigators and what has been described in the referred literature(7,8,14,18,19). 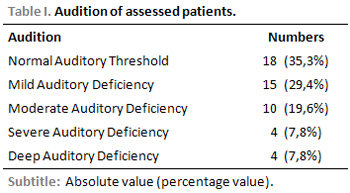 Such finding has probably happened because many of the patients described (29.4%) presented mild auditory deficiencies, as it has been previously described. According to WHO(26), such degree of auditory deficiency is not considered incapacitating, that is, does not prevent the individual from having problems to perform his/her activities. In the individuals who presented moderate auditory deficiency (19.6%), it has been verified that the average of the thresholds would be many time in the limit between mild and moderate. Probably due to that, although they presented incapacitating auditory deficiency (from moderate auditory deficiency), they were not experiencing the negative experiences of the auditory handicap. Again, statistically significant differences have been observed only when age was compared to the physical domain. It is know that aging is determinant of the functional capacity of individuals, once the proportion of people with physical problems who require partial or total help to perform their daily activities is higher in older people (29). It has still been verified that there was no co-relation between the results of the WHOQOL-bref score, age and audiometry results. The only existing co-relation, which is inverse and moderate, has been observed between age and social relations, that is, the higher the age, the lower the participation of the elderly in social activities and the lower the social support and the personal relationships that they present. That is also mentioned in the specialized literature (29). The human relations are within a wider concept - the social performance - which covers the interaction of the individual with others. The elderly need a wider social group, in function of both the management of their social activities and the creation of a support system, like supporting networks which should remain in the community. However the social group starts reducing in that period of life, due to death of relatives and friends and to the adult phase of their children, who, many times, do not provide the elderly with the social support they should have and which would enable their integration in the community, increasing the ability to recover from diseases and reducing the morbidity/mortality risks (29). In the present study it was possible to verify that there was no relation between quality of life and auditory deficiency in the study group. The age variable influenced the presence or absence of auditory deficiency and the physical and social aspects of life quality. Gender influence has not been observed in audition and quality of life in the assessed individuals. 1. Carvalho JAM, Garcia RA. O envelhecimento da população brasileira: um enfoque demográfico. Cad Saúde Publica. 2003, 19(3):725-33. 2. Kalanche A. Envelhecimento populacional e as informações de saúde do PNAD: demandas e desafioscontemporâneos. Posfácio. Cad Saúde Publica. 2007, 23(10):2503-5. 5. Morell CH, Gordon-Salant S, Pearson JD, Brant LJ, Fozard JL. Age- and gender-specific reference ranges for hearing level and longitudinal changes in hearing level. J. Acoust. Soc. Am. 1996, 100(4):1949-67.
http://www.clinicalgeriatrics.com/article/193. Acesso em 01 de dezembro de 2007. 12. Béria JU, Raymann BCW, Gigante LP, Figueiredo ACL, Jotz G, Roithmann R et al. Hearing impairment and siocioeconomic factors: a population-based survey of na urban locality in southern Brazil. Pan Am J Public Health. 2007, 21(6):381-7. 13. Amaral LCG, Sena APRC. Perfil Audiológico dos pacientes da terceira idade atendidos no Núcleo de Atenção Médica Integrada da Universidade de Fortaleza. Fono Atual. 2004, 27(7):58-64. 20. Arlinger A. Negative consequences os uncorrected hearing loss - a review. International Journal of Audiology. 2003, 42:2S17-20. 28. Neri AL. Envelhecimento e qualidade de vida na mulher. Anais do 2º Congresso Paulista de Geriatria e Gerontologia. São Paulo, 2001.p.1-18. 30. Pereira RJ, Cotta RRM, Franceschini SCC, Ribeiro RCL, Sampaio RF, Priore SE et al. Contribuição dos domínios físico, social, psicológico e ambiental para a qualidade de vida global de idosos. Rev Psiquiatr. Rio Gd. Sul. 2006; 28(1):27-38. 1. Doctor's Degree on Biomedical Gerontology. Speech Therapist. Professor of Speech Therapy Degree and of Audiology and Physical Education Post-Graduation. Assistant Professor of Post-Graduation on Public Health - ULBRA - Canoas/RS. 2. Doctor's Degree on Human Movement Science - UFRGS. Physical Education Professor. Professor of Physical Education Degree and Post-Graduation at ULBRA - Canoas/RS. 3. Doctor's Degree on Psychology - Universidade Pontifícia de Salamanca. Nurse. Professor of Nursing Degree and Post-Graduation. Assistant Professor of Post-Graduation on Public Health - ULBRA - Canoas/RS. 4. Doctor on Social Psychology - USP. Physical Education Professor. Professor of Physical Education Degree and Post-Graduation at ULBRA - Canoas/RS. Assistant Professor of Post-Graduation on Public Health - ULBRA - Canoas/RS. 5. Doctor's Degree on Psychology - Universidad de Barcelona. Physical Education Professor and Psychologist. Professor of Physical Education Degree and Post-Graduation at ULBRA - Canoas/RS. 6. Speech Therapy Student at ULBRA - Canoas/RS. Scientific Initiation Scholarship - ULBRA - Canoas/RS. 7. Physical Education Student - ULBRA - Canoas/RS. Volunteer Investigator. 8. Physical Education Student at ULBRA - Canoas/RS. Scientific Initiation Scholarship - ULBRA - Canoas/RS. 9. Doctor's Degree on Phytotechny - UFRGS. Biologist. Professor of Physical Education Degree and Post-Graduation at ULBRA - Canoas/RS. 10. Doctor's Degree on Biological Science (Neuroscience) - UFRGS. Biologist. Professor of Physical Education Degree and Post-Graduation at ULBRA - Canoas/RS. 11. Doctor's Degree on Science of Physical Activity and of Sport - Universidad de León. Physical Education Professor. Professor of Physical Education Degree and Post-Graduation at ULBRA - Canoas/RS. 12. Doctor's Degree on Education. Universidade Metodista de Piracicaba. Physical Education Professor. Professor of Physical Education Degree and Post-Graduation at Universidade Luterana do Brasil - ULBRA - Canoas/RS. Universidade Luterana do Brasil - ULBRA - Canoas/RS (Lutheran University). This article was submitted at SGP (Publication Management System) of R@IO on December 12, 2007 and approved on February 10, 2008, 13:40:12.